Vanessa Lok is a first-year student studying BSc Pharmacology and Innovative Therapeutics in the School of Biological and Chemical Sciences. We caught up with her at the QChallenge Abroad pre-departure event to find out more about her upcoming trip to Stockholm, Sweden. Thanks for taking the time to chat with me. Could you introduce yourself tell us what you study at Queen Mary? Sure! 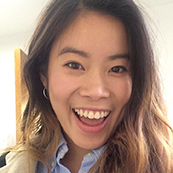 My name is Vanessa Lok and I’m in my first year studying BSc Pharmacology and Innovative Therapeutics in the School of Biological and Chemical Sciences. Great! So which destination on the QChallenge programme will you be heading off to and do you know what you’ll be getting up to while you’re out there? I’ll be heading off to Stockholm, which I’m really excited about as it’s somewhere I’ve never had the chance to visit before. I’m not sure of the specifics, but I know from the briefings that it will be a combination of different things such as working with global businesses, governments, local charities and international not-for-profit organizations. I’ve been abroad but definitely nothing like this – mainly just things like holidays. That’s why I’m really interested in taking part. I was originally looking at opportunities to study for a semester abroad next year in my second year. I came across one opportunity that I liked the look of on the Queen Mary website, although it turns out that it doesn’t actually apply to my programme. Luckily, there are plenty of other opportunities to go abroad outside of your academic programme through services such as the Global Opportunities team. That’s how I found out about the QChallenge Abroad programme and it didn’t take me long to decide that I wanted to apply for it. It’s great you managed to find an opportunity to suit you. How are you preparing for your trip? Thanks, I’m really excited! It’s perfect because it’s during April so I have time to do some research on the local area and find out about things I can do in my spare time. I really want to make the most of this opportunity since it’s going to be my first time ever visiting Stockholm. I’ll look up any places which are close to where I’ll be staying, and around the university itself for any activities that I could join in with. That’s the fun side of it, but of course I’ll need to think about what to pack as well. I’m hoping the weather will be a bit warmer around April, although I know that Stockholm is cold a lot of the time! It all sounds great! Do you feel like you’ve had enough support during the whole process? The support has been great from the university. The Global Opportunities team have sent us lots of reminders and emails about the programme and any upcoming information. After they confirmed by place, the team sent the flight confirmation details shortly after. They also provided us with an insurance form that we just needed to fill in, print off and keep as a copy to bring along when we go on the trip. They sent us some more information last week containing the briefing packs (which included presentations, locations, activity plans, full flight information, emergency contact numbers and that sort of thing). That told us everything that we would need to know. I’m grateful that they prepared everything in advance so that all I have to think about is making the most of the trip and having a great time! Amazing! Thank you for sharing all this with us and I hope you have a great time in Stockholm! No problem at all, thank you!